Beef lovers in Maharashtra got a great shock as President Pranab Mukherjee has given his assent to the Maharashtra Animal Preservation (Amendment) Bill, 1995, 20 years after the Maharashtra Assembly passed the Bill during the BJP-Shiv Sena rule in 1995. Reacting to this news, 25000 cows celebrated by dancing to the tunes of the OST of farmville game. Talking to News Reporters, 7 year old Mamta Mookarni, a black and white cow said that she could now walk around the streets of Mumbai in peace without having to go through the anxiety of when she will be slaughtered by the Qureshis. 17 year old muscle flexing Palapathy Kujay told reporters that if the same rule can be implemented in South India, it would help his south Indian cousins from going through the torture they were going through all these years. The cows started mooing to the tunes of "Selfie Pulla" a popular song from a Tamil movie. Some cows were even seen giving the lion's roar. There would not be any leather shoes and any killing of cows or even bulls anymore in Mumbai and surrounding places. A very shy 4 year old "Sonney Leony" finally came out of her shy nature and gave a soul stirring speech to the 25000 cows gathered to celebrate the good news. 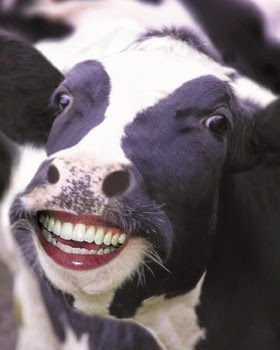 She said that if humans can stop drinking cow urines, the cow community will feel more happy . Few cows ended up having dysentery after listening to her speech. The President of the All India Cow Union - Mr. SuSu Swami said that 3rd March will be celebrated all over the world as International Cow Day. He gave an inspiring two hour speech in which he highlighted the 73 different types of ill treatments that cows had to go through all these years. Known for inviting trouble with his loose talk, Susu Swami said that the Government should also ban human beings from touching the breasts of cows. All the other cows Mooed in agreement to the inspirational speech of Susu Swamyji. The above picture is a Picture of Susu Swamy when he took a selfie after making his speech. Secret reports reveal that one human being even tried to milk Susu Swamy without realising that he was a Bull. The human beings, on the other hand are divided with their views. The Vegans were laughing to glory and the Non Vegetarians were cribbing big time in Social media. What if beef is banned in Maharastra? We can still eat the other animals and birds.